Armourgeddon is a company based in based Leicestershire, England that deals in paintball matches using a fleet of British tanks, specifically the FV432 Armored Personnel Carrier. After an introductory training session, teams of three battle it out tank-to-tank on an old WWII bombing range. Now, this isn’t the only activity the company specializes in (they also have, among other things, air rifle shooting, archery, hovercraft, and standard woodland paintball games), it just happens to be the most unique. Each marker comes with a bonus training manual on teamwork and strategy. 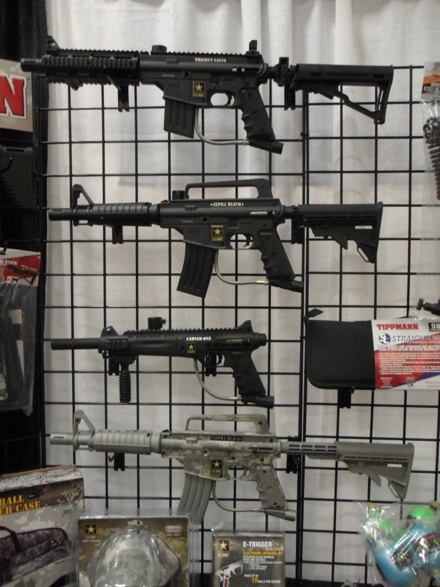 For more info on these products and others, visit Tippmann.com. This music video for ‘Spitfire’ by Porter Robinson features two opposing teams slinging paintballs at each other, slow motion sequences throughout, a referee with a dog named “la p00ch”, and visual effects that make it look like a multiplayer video game. Most impressively, it was shot in just one take. This video by Youtuber ‘CorridorDigital‘ shows the almighty power of a potato cannon that shoots paintballs, in slow-motion, courtesy of a high-speed camera. That disarm move near the end was pretty slick, too. At first glance this looks more like a SBR than a paintball gun, but it most definitely is the latter. The Tiberius Arms T4 Rifle comes with two 14 round magazines, which accept Tiberius’ proprietary First Strike round, a bullet-like paintball. It features billet machined upper and lower receivers, a monolithic rail platform, functional charging handle, tri-rail riser mount with 4 side rails, and both remote air and hopper adapters. 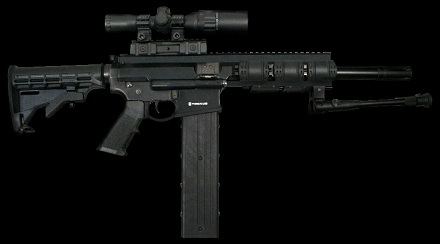 The T4 also comes equipped with a 4×32 dual illuminated scope, low-profile bipod, and a collapsible AR-15/M4 style stock.